So you’ve bought a laptop, but now need a laptop bag to transport and protect your new purchase? We’ve compiled a list of 3 of the best laptop bags around, with a variety of prices from low to luxurious, all with our impartial reviews. 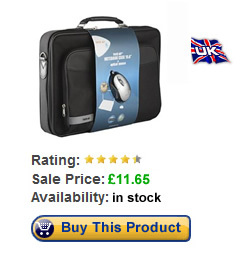 This model from Tech Air is a 15.6 inch Laptop Case, complete with a Shoulder Strap, as well as the unusual addition of a free USB powered 2 button mouse. The major selling point of this bag is the price – around £12.00 – and although lacking in certain features that more expensive laptop bags may include, such as having a padded shoulder strap, it provides functionality at a very affordable price. The front section includes a handy document holder, which doubles as an accessory (power adapter etc) holder, the whole unit is shower proof. This helps gives you peace of mind – although as your laptop will be inside, it’s probably best to not be in a situation where you need to test this! Pros: The cost, it’s pretty well made, shower proof, and you get a free mouse! Cons: The mouse isn’t great, if you’ve spent £100’s on a laptop then maybe it might be an idea to spend a little extra on a fancier bag to protect it. To conclude: The mouse isn’t up to much, as you’d expect with a freebie, however despite it’s plain looks, the bag represents outstanding value. 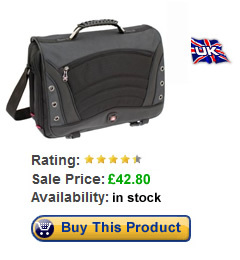 If you’re looking for a cheap laptop bag then you could do a lot worse than this offering from Tech Air. Buy the Tech Air Laptop Bag or read more reviews. This Swissgear GA-7488-14F00 Saturn 17 Inch Laptop/Notebook Messenger Bag, as the name suggests fits 17″ laptops, and is available for around the £45 mark. Upon first glance of this bag you can see that the additional cost has gone into the choice of materials and features – the bag looks, and feels expensive, with multiple sections for your laptop and all it’s accessories. The main laptop section is padded, as well as having a velcro strap to hold the laptop in place. Next to this is a spacious A4 section, to fit all of your documents, complete with a useful file divider. The front pocket has room for all of your smaller day to day items, such as wallet, phone, pens, MP3 player and diary. The bag is made by the same company who manufacturer Swiss Army Knives – which is indicative of the quality and workmanship which has gone into this bag. Cons: A bigger investment than the budget offerings – is larger and weighs more – may not be allowed as hand luggage when flying. 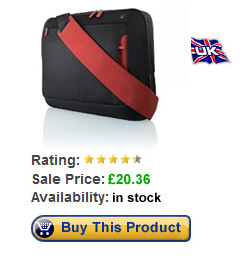 To conclude: Great Quality bag, designed to keep your laptop safe and secure. Offers good value, and considering the cost of your laptop, relatively speaking the outlay for this laptop bag isn’t too much. If you plan on flying a lot, make sure the dimensions of this bag don’t exceed your Airline’s hand luggage allowance. Buy the Swissgear Saturn Laptop Bag or read more reviews. This Belkin 17″ Laptop Messenger Bag in Black and Red is for 17″ laptops, and is also available in blue/black, for those with an aversion to red. This Belkin bag is a middle of the road bag – not ultra cheap, and not top of the range either – at around £20 it’s somewhere inbetween. Features wise it includes all the standards: Several compartments for your laptop, it’s accessories plus any other bits and pieces you need to carry (keys, phone etc). The maximum internal dimensions that this bag can take are 39cm x 27cm x 5cm – so measure your laptop before purchasing and make sure it doesn’t exceed these. The bag looks neat and well made – it doesn’t look as expensive as the Swissgear bag above, but it is less than half the price. It’s made from a high-quality 100% polyester fabric that is both durable and weatherproof, giving you peace of mind for British commuting. The straps and zips feel well made and sturdy, and shouldn’t let you down. Cons: Larger laptops may not fit – measure your laptop prior to purchase. To conclude: This offering from Belkin offers good value, and safe padded protection for your laptop. At £20 it’s a bargain – and is available in a variety of different colours too. Buy the Belkin Laptop Bag or read more reviews.